Glitches and wobbles aside, Homefront: The Revolution is an adequate shooter that features some interesting moments. It isn’t bad, but it isn’t good either. America was invaded by North Korea in the events leading up to the original 2011 Homefront. In this sequel, you play as Ethan Brady, part of a guerrilla resistance that is trying to take back Philadelphia from the Korean occupation. This occupation was achieved by North Korea adding backdoors into military and communications technology that America purchased in bulk, then using this to sabotage the country’s defenses and infrastructure. Benjamin Walker, apparently the centerpiece of this whole revolution, is captured in the beginning of the game, and you spend a lot of your time trying to get him back by going to neighborhoods where he isn’t and shooting enemies who have nothing to do with him. Through the campaign, things explode, plot twists happen, resistance is fomented, and it’s really hard to care. I found it tough to be interested in a plot I had little hand in. Brady is a silent protagonist who’s new to the movement. You’re not the hero, but you’re not a dramatically interesting antihero either. All of the game’s climactic moments are non-interactive. You ride in a tank while enemies fire at you, but you don’t fire back. You breach a much-touted area entirely in cinematics and then are praised for your bravery. While I don’t believe that games exist to make players feel powerful, there were cool weapons or pivotal battles that I watched in cutscenes or barely participated in. The game feels like a bunch of sidequests that are peripheral to whatever Benjamin Walker is up to. Most of the campaign is spent running across the multiple zones of the game’s open world map. Red Zones are burnt-out urban areas where enemies will shoot you on sight. Yellow Zones are populated with neutral NPCs you can blend in with as you undertake guerilla strikes against North Korean strongholds. You can turn all of these areas friendly by capturing points or hacking into transceivers via a simple connect-the-lines minigame. Performing successful hacks or clearing all the enemies in an area converts them into bases of operation where you can resupply and recruit resistance members to fight alongside you. The bases also serve as save points, since Homefront: The Revolution doesn’t allow manual saving. Dying on a mission sends you back to the nearest base, which can mean a long trek back through the map if you haven’t turned enough areas friendly along the way. While getting sent back is frustrating and time-consuming, it’s a pleasure to move through the maps. Red Zones are visually indistinct, all greys and browns, but there are plenty of paths, places to hide, and motor bikes for faster travel. The game has an oddly unpredictable day-night cycle, allowing the cover of darkness to help you avoid patrols. I felt like a guerrilla fighter as I ran along fences, clambered through buildings, took out passing armored cars and soldiers, and then faded into the rubble. Even as I swore at how much progress I’d lose when I died, making my way through the Red Zones was engaging and occasionally pulse-pounding. One of the game’s Red Zones. Yellow Zones are differently enjoyable. They’re full of opportunities for small acts of sabotage: freeing prisoners, hacking television monitors, and tuning radios to broadcast resistance messages. These acts add to the accumulation of a “hearts and minds” score. Reach 100% and you can inspire the people to rebel, filling the town with resistance members who battle the North Korean occupiers so you can do your own thing. The several Yellow Zones in the game are visually distinct from each other. One is a burnt-out residential part of Philadelphia, while another was the clean, bureaucratic area where American collaborators with the invaders were housed. While “hearts and minds” missions dragged, especially when they were key to the plot, it certainly wasn’t due to the map. I often grew tired of the Yellow Zone missions, especially the “hearts and minds” ones, because they were somehow both maddeningly obtuse and drearily straightforward, made all the worse by the game’s many glitches. Homefront: The Revolution lacks a coherent visual language, instead filling the game with mixed signals and poor signposting. A door to a key safehouse late in the game, for instance, is designed just like every door you can’t open–except this one you can open. In my game, the door sometimes remembered its roots and refused to give me the prompt to open it. Items you can loot have a white sheen, but environmental debris sometimes has it too, meaning I quickly picked up the bad habit of spamming my E key at most everything. The game froze between missions, sometimes failed to count my “hearts and minds” score until I died, and often left completed objectives on the map, sending me backtracking, wandering, and wasting time. There are spatial puzzles with switches, walkways, and powering doors, but they’re jumbled and difficult to read, providing misleading visual cues that felt badly designed instead of challenging, especially when they didn’t work. In a climactic end-of-game mission, for instance, I was told to jump to a platform; ahead of me was a ramp, which I assumed I should jump off of, like all the rest of the game’s ramps. I plummeted to my death. Reassessing on my next go, I saw an air vent leading around the building and across from the ledge of the adjacent building. It screamed “climb on me and then jump,” but I fell every time I tried. I tried a lot, assuming it was the game’s fickle mantling and collision, until, randomly, a window-washing platform with NPCs appeared in front of the ramp to help me continue the mission. I’m sure there are plenty of players who didn’t struggle with these issues, who got different glitches or who realized right away they couldn’t get into that clearly open window or knew how to cut the unreachable bolts to drop the walkway that would let them reach the bolts. But for a game–especially a shooter–to feel satisfying, players need to be able to make quick decisions and feel they have mastery over the game’s most important pieces of information. Games don’t owe me a feeling of powerfulness, but Homefront: The Revolution felt like it added a dose of confusion to pass as challenge. The most challenging part of the game was trying to accomplish things while its abundant enemies shot at me. The game is fond of throwing too many enemies at you, including some who are just bullet sponges. They charge you. You shoot them. Then more charge you. Ambushing a passing patrol in a Red Zone. You have a range of weapons to deal with all of the game’s enemies. You’ve got molotovs, explosives, hack tools that can turn armored cars to your side, and even an exploding RC car. These tools are a lot of fun, and they can be crafted with materials you’ve scavenged. Weapons can be customized on the fly via a radial menu that allows you to add sights, grips, and convert your weapons to and from different types, turning your pistol into a submachine gun or your battle rifle into a “freedom launcher” that shoots rockets and red, white, and blue confetti. While the animations and different effects for these changes are satisfyingly done, they take a bit too long to make flexible tactics really viable. The expanded arsenal doesn’t keep the game from at times being just too frustrating. At one point in the game, I had to steal a tank from a North Korean shipyard. A computer-controlled companion, hacking the tank from off-site, insisted I somehow stay near the tank and draw enemy fire away from it. As I tried to figure out how to do both, more and more soldiers rolled in, ramping up their assault with rocket launchers and armored cars. My tank became 80% hacked and then exploded. This happened so many times that I thought maybe it was part of the mission. I felt stuck. The battle wanted me to move but then punished me. I needed to switch weapon types but it took too long—and it just became a chaotic and frustrating war of attrition I eventually managed to win by hiding behind the tank and taking out the enemies with rocket launchers. The fact that they’d joined the battle was just one of the many things my companion warned me about as she shouted a confusing stream of directions, swears, and narration of her off-screen hacking. The best part of Homefront’s combat is avoiding it, sneaking around enemies using creativity and your wits. This is made difficult by the game’s two best enemies: drones and blimps. Drones are pretty much Half-Life 2 scanners, floating cameras that alert guards to your presence if you fall into their searchlight. When your minimap indicates that one’s nearby, you need to constantly glance up to make sure it doesn’t spot you. In similar fashion, Red Zones features a monstrous blimp that bellows like a sad whale as it patrols. If it catches you, it signals your location and sends enemies pouring your way. There were a number of times when, engaged in a firefight, I lost track of the blimp, only for it to drift up behind me and sound the alarm. The blimp and the drones call for a vertical spatial awareness that’s seldom present in games, and they were a unique touch in a game sadly lacking in uniqueness. For every mechanic the new Homefront employs, I could think of games that did it better. The bullet sponge enemies and urban design felt like The Division. The drones, the design of the North Korean soldiers, and some of the game’s spatial puzzles are straight out of Half-Life 2. Unlocking communication towers feels like Far Cry. The multiplayer, which Kotaku’s EIC Stephen Totilo and I played for a few hours, was a forgettable team-based PvE affair with the loot crates and skills you’d see in any multiplayer shooter. One main character’s weak efforts at moralizing at me by randomly reminding me the occupiers are people too felt like a watered down Spec Ops: The Line. I started the game on the 31st anniversary of the Philly MOVE bombing, in which the Philadelphia police department destroyed a neighborhood while bombing the row house of a black liberation group. While Homefront: The Revolution is not about this, this real-world context weighed heavily on my mind as I ran through the game’s Philadelphia. I thought about that. I thought about the idea of American exceptionalism that leads creators of fiction to make these “but what if it happened in America” scenarios. There is no grappling in this game with occupation, with the policing of urban areas, with the reliance on technology and the outsourcing of its production that the game’s premise hinges on. 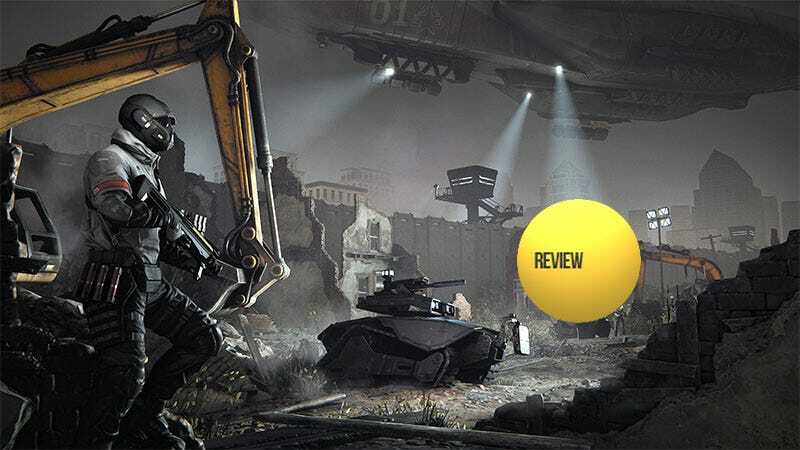 Homefront: The Revolution uses the trappings of modern political conflicts but somehow strips them of their content, relying on blunt, lazy tropes as a stand-in for meaning. I’m loathe to criticize a video game for not setting out to be a nuanced political treatise, but I can’t help but feel that dressing up as modern day issues and then pretending they don’t exist is boring at best and offensive at worst. Homefront: The Revolution is a game that says nothing, one that seems to assume games have nothing to say. One of the game’s Yellow Zones— this is where collaborators with the North Koreans live. I could call the game bad for all its faults, but it doesn’t even feel fair to call the game bad. It is a traditional game, featuring all the things typical games of its type feature. Glitches aside, there’s little here that would convince me to tell you not to play it. I didn’t enjoy most of my time with it, but I wasn’t miserable either. There’s nothing wrong with being Ethan Brady, but you could have been Benjamin Walker.